A few steps from the North Sea, on the beach near the hamlet of Oostduinkerke, Belgian soldier 2é Grenadiers Aloïs Walput is tied to a pole and shot by his fellow-men. 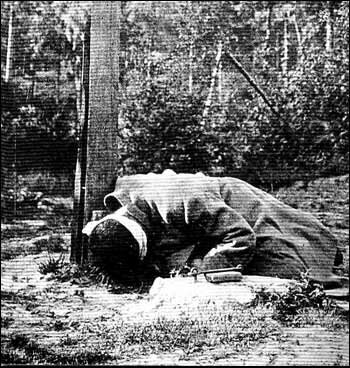 The execution of this 21 year old war-volunteer took place on 3rd June 1918. The picture was made a few seconds after the man died: two soldiers cut the body loose, an officer (the medical doctor?) takes the exact time, the spurred commander of the firing-squad looks on. It was the last of thirteen known cases wherein a Belgian court martial send a soldier to death. 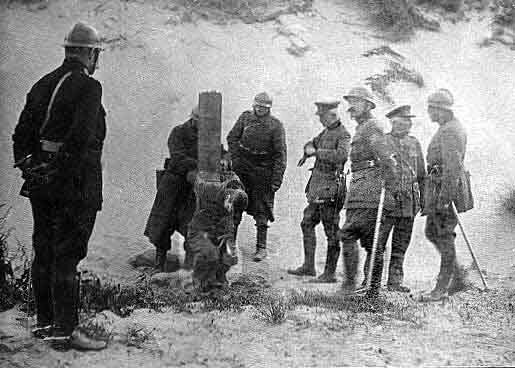 During the Great War many soldiers were executed. The armies wanted to set examples to the troops. Do not walk away from our war - we shoot you if you do. The men were shot for desertion, mutiny, cowardice (even if it was caused by shell shock or other mental affections), and other breaches of discipline. During the war the executions were kept silent. Robert Graves: "I had my first direct experience of official lying when I arrived at Le Havre in May 1915 and read the back-files of army orders at the rest camp. They contained something like twenty reports of men shot for cowardice or desertion. Yet a few days later the responsible minister in the House of Commons, answering a question from a pacifist, denied that sentence of death for a military offence had been carried out in France on any member of His Majesty's Forces" (in Goodbye to all That, 1929). After the war all armies made their files on the executions top secret. Of course there were rumours and in a few cases the truth leaked through. Only these last years some of the archives have been opened and now, slowly, thanks to the efforts of independent researchers and journalists, the stories become public. As a result of this political debates have been started in several countries. about reviewing the sentences. New-Zealand has already pardoned (through Act of Parliament) the soldiers it executed in WW1. The Canadian government has offered an apology and formally announced its regret for what happened. England announced in August 2006 that it will formally pardon (on moral grounds) all soldiers who were shot by firing squads. In total British court martials had 306 soldiers shot at dawn. Among them were 25 Canadians, 22 Irishmen and 5 New-Zealanders. Australia was the only country that did not want its soldiers (all volunteers) to be executed. The 129 Australians (including 119 deserters) that were sentenced to death during the war (117 in France) were not shot. Between April 1917 and November 1918 American court-martials sentenced 24 American deserters to death. None was actually shot. Stragglers and deserters were often publicly humiliated. From the German army about 150,000 soldiers deserted. Most of them fled to the neutral Netherlands and to Denmark and Switzerland. From those who got caught no more than 18 were executed (compare this to the 10.000 deserters Germany shot in the second worldwar). In the French army more than 600 soldiers were put to death. Little known is the French decimation (the shooting of every tenth person in a unit) of the 10e Compagnie of 8 Battalion of the Régiment Mixte de Tirailleurs Algériens. During the retreat at the beginning of the war these French-African soldiers refused an order to attack. They were shot on the 15th of December 1914 near Zillebeeke in Flanders. Zie ook het (Nederlandstalige) artikel De Dood kwam bij het ochtendgloren, dat uitvoerig ingaat op het onderzoek naar de executies bij de verschillende legers.